If you’re considering a trip of a lifetime and you really want to make a splash, consider heading somewhere that is truly unique and awe-inspiring. The continent of Africa is one such place where you can be sure that you will make memories and have experiences that will last a lifetime, along with challenging yourself in ways you never thought possible by taking on different activities you can only do in Africa. One of the best places to go if you want a bit of everything is the country of Tanzania – and here are the top points you need to check out. This unique region in the north of the country, just south of the Serengeti is known for its volcanic caldera as well as gorges and a huge array of wildlife. Within the caldera itself is a beautiful landscape and home to a number of Maasai tribes which were relocated here throughout the course of history when their various other lands were bought by the state for a number of purposes. From the ridges of the caldera, much of the crater can be seen, lending itself to being a photographic and visual wonder. Don’t miss the purported oldest human footprint on the planet in the area either, an interesting stop for anyone interested in human history. 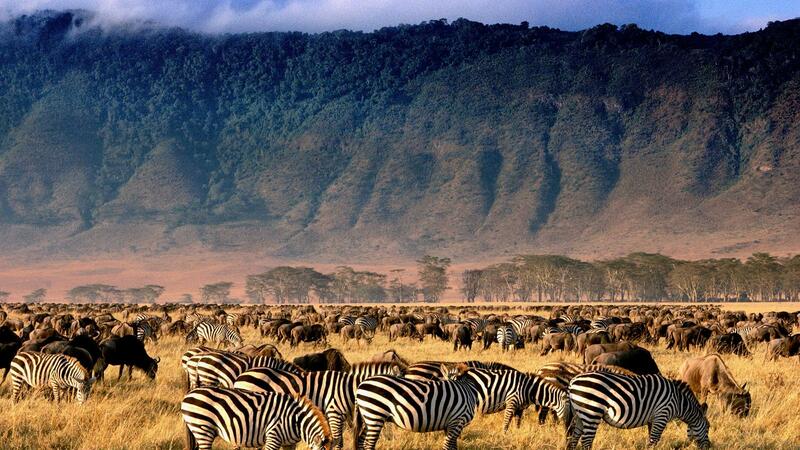 North of Ngorongoro is probably the world’s most famous safari site – the Serengeti. With a plains type climate and topography, the Serengeti is home to numerous different animal species including cheetahs. In fact, this is one of the only spots in Tanzania you will be likely to see cheetahs due to the vast open plains they like to run on. The Serengeti can get fairly packed during high season though, so be prepared to deal with crowds and have to queue to view the animals, akin to a zoo. For a quieter experience try organising safaris to the south in the Maswa Game Reserve, or to the east in nearby Arusha National Park. Probably one of the most challenging things you can do in Tanzania, climbing Kilimanjaro is not for the faint of heart. Through mohji.com you can organise a fantastic tour with guide that will help you climb this famous mountain in as much comfort as possible. The mountain is extremely high, so be prepared to allow at least one week to ascend and descend so that you can acclimatise at each interval of ascent so you don’t fall ill. Make sure to research more Mount Kilimanjaro facts online and prepare yourself in advance by eating right and getting into good physical condition so you make it easier on yourself. After all, you want to be successful at your attempt to summit Africa’s highest point! After all is said and done and you’ve done all the inland activities, the safaris, the climbing and more it’s a great opportunity to head to the beaches of Zanzibar to chill out for a few days snorkelling and soaking up the sun on the white beaches highlighted by some of the bluest waters ever. The east coast is littered with small local villages with the occasional guest house or resort, with the north coast and the village of Nungwi being a great spot for those looking for a party destination. For a mix of chilled and hopping, head to Kendwa on the west coast, a great spot for those who like to chill by day and party by night. So for those who are looking for a unique and fantastic destination to head to this summer or next consider Tanzania. With so much to see and do, it’s easy to get lost in the beauty, history and excitement of this amazing nation. Enjoy!